In this Q&A, Temple University authors Daniel Biddle and Murray Dubin discuss Octavius Catto, the subject of their new book Tasting Freedom . Q: Catto taught at the Institute for Colored Youth. He was very instrumental in educating free slaves and helping them get established. His famous speech at a graduation contains the phrase, “There Must Come a Change!” It started as a history of the school and ended with a call for equal rights. It had an immediate impact and was reprinted and circulated widely. How far-reaching was his speech? Q: Tasting Freedom has a terrific chapter about baseball and Catto’s experiences with the Pythians. Interracial matches were played unofficially. Catto’s team played in the first game between white and black clubs. Did he have the respect of whites, or did he have a negative reputation? Q. The chapter on the battle for streetcars shows Catto’s strength as an agitator. He tried to change laws. What do you think he could have accomplished had his life not been cut short? Catto was shot to death in an 1871 election-day riot in Philadelphia that was one of the worst days of violence that the city had ever seen. We described the riot in the book as “five blocks in one direction and three in the other.” Scores of black men were shot and beaten and an untold number were scared away from the polls. To watch a video of authors Daniel Biddle and Murray Dubin discuss Tasting Freedom, click HERE. Tammy Anderson received the Charles Horton Cooley Award from the Society for Study of Symbolic Interaction for her book Rave Culture. Excerpts from speech congratulating Anderson on her scholarship are below. The author deserves more than one round of applause. 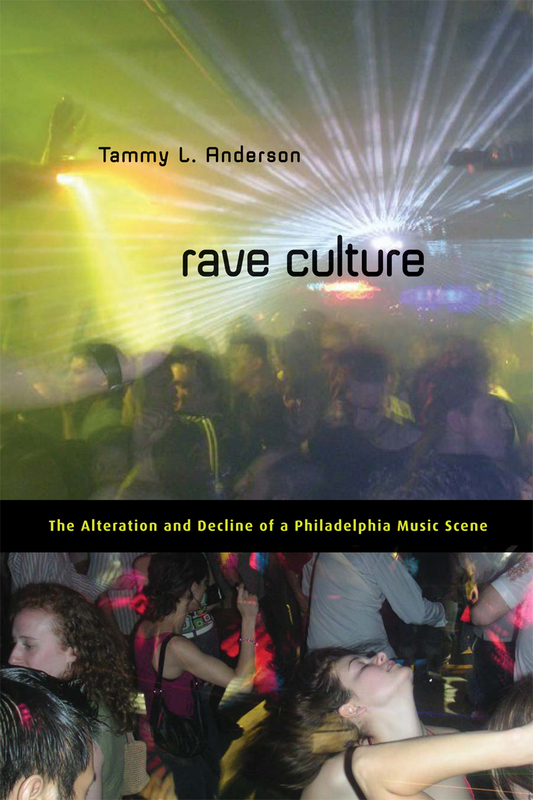 So, let me tell you right now that the book that garnered our mutual praise and approbation is entitled Rave Culture: The Alteration and Decline of a Philadelphia Music Scene, written by Tammy L. Anderson. Professor Anderson’s book details the rise and decline of the electronic music scene that thrived especially during the decade of the nineties. Using a combination of auto-ethnography, penetrating participant observation, and strategic interviews, she explains the factors responsible for the decline of this “cultural scene” and the different efforts made to resurrect it. Her analysis reveals the range of stakeholders in this particular subculture and how each group reflects the different individual and collective identities produced by the rave culture phenomenon (and by extension, any subculture). Moreover, Professor Anderson shows how various social factors, beyond the commercialization of the rave culture scene, contributed to its erosion. The generalizations offered, based on “thick description” and multiple interviews, are strengthened by corresponding analyses of the electronic music scene in London and Ibiza, Spain. This brief overview only hints at the richness of Professor Anderson’s accomplishment for her exceedingly valuable contribution to our collective enterprise. Q: You state outright that “the gap between our language about civility and the real nature of American political discourse and practice is at least as wide as it has ever been.” What do you think accounts for this gap? A: I think much of the gap is rooted in America’s founding ideas and rhetoric. The ideals expressed by Thomas Jefferson and others are just that—ideals. We were all brought up on these extraordinarily high-minded documents, and it is difficult for any democracy to “live up to” abstract idealism. Hence the gap. Q: You focus much of your book on examining Sarah Palin and Barack Obama on the 2008 campaign trail. Why was this political rivalry the best contest for analyzing civility and incivility? A: The 2008 campaign was ideal for studying civility because of its emotional flavor, which brings out both the best and worst in American politics. And the intensity of Internet communication boosted these emotions more than we could have predicted. Q: You describe civility as “strategic tool or a weapon” in politics. Why are politicians so inclined to wield incivility, which you claim “is destructive and blocks proper democratic debate”? Is negativity really more powerful in communicating a point (about an opponent)? A: Research has shown that negative campaigning does work, which is why we see so much of it. We have gotten into a bind where positive campaign rhetoric is often empty and banal. Negative campaigning, while disturbing, does often focus on issues. What we need to stake out is a political discourse that is exciting and substantive at the same time. Q: You point fingers at the media and their “take-no-prisoners” approach when covering the 2008 campaigns. Do you feel the journalists’ quest for headlines is provoking this bad/incivil/undemocractic behavior? A: Journalists can be blamed for fueling some of the incivility we see, but they take their cues from political actors and citizens. As long as Americans tune in to rants and political attacks, journalists will keep focus on these incidents, no matter how unproductive. Media survive by keeping us engaged, and their profit orientation is no different than other industries striving for financial success. Q: You argue that if we listen and be respectful—and engage constructively—even if/when we disagree, civility can be restored. Why are people so quick to be uncivil and what steps can be used to recover it? A: I don’t know that people are prone to incivility. But they do lack the tools to be passionate and substantive at the same time when they debate. It’s more a matter of learned behavior than anything. Q: If our politicians—and by extension, the media—are more civil, do you think this “good” behavior will trickle down to the rest of American society? Or do you think that Americans are more civil and set better examples than our politicians and media? A: The models at the top have to be strong; Americans look to leaders, journalists, and even celebrities to figure out the bounds of public behavior. We citizens are not sheep! But we do a surveillance of culture, and how famous people act does matter in setting the tone. Q: Sarah Palin has been a target by journalists for her speeches, rhetoric, and emotional connections with audiences. You describe her as “one of the shrewdist strategic users of both civility and incivility.” She was an impressive orator, yet often castigated for her comments. Rude Democracy offers a rather balanced view of Palin. Why did you take this approach? A: I do believe that Palin was degraded due to her gender, in much the same way that Hillary Clinton was demonized. Men of passion—agree with them or not—simply do not suffer the sort of treatment that women candidates still do. A: I don’t know that they are particularly helpful, as we try to build a more civil democracy, but they aren’t really doing any serious damage either. If Americans can become better debaters, and argue with substance, they’ll be adept at separating the wheat from the chaff, when it comes to televised ideologues. It’s really up to us—as responsible citizens—to figure out what is a good or bad argument; Fox and MSNBC, on the other hand, are trying to make money, not democracy. Q: Your example featuring Barack Obama—specifically, his speech at Notre Dame—explains how we might locate civility in debates where the subjects generate passionate, even hurtful emotions. What lessons does Obama offer the public about finding a common ground and being civil? A: He models intelligent argument so very well, and lays out why it is vital and difficult to debate, with dignity and passion. His challenge is that it is hard to focus on these matters when disasters rule the news—the economy, the BP leak, and other urgencies. Finding common ground is a long-term prospect. Q: Your last chapter in Rude Democracy considers college students and political arguments. You state that today’s young adults are unhappy with civility as it exists today. Do you think this generation, raised on the Internet, is capable of making the changes we need? A: Yes, I am very optimistic about our young people. My undergraduates are full of life and optimism. They are up to the challenge of greatly improving American democracy if we give them the tools and inspiration. They will find the path forward. The team of directors spearheading a university press-branded consortium to sell collections of ebooks to academic libraries—Steve Maikowski, New York University Press; Eric Halpern, University of Pennsylvania Press; Alex Holzman, Temple University Press; and Marlie Wasserman, Rutgers University Press—is pleased to announce a grant from the Andrew W. Mellon Foundation for $47,000, to be used to advance the venture toward its fall 2011 launch. Fifty-five university presses have expressed a strong interest in participating in this project. Managers at many of these presses understand that the separate efforts of individual presses are an inefficient solution to the challenge of disseminating university press ebooks to academic libraries. By working together to achieve efficiencies of scale, presses that join the consortium will put the needs of the scholarly community as a whole at the top of the agenda.With the benefit of the new Andrew W. Mellon Foundation grant, the press directors organizing the venture will draft a prospectus clarifying a viable business model, including user features and pricing, and will begin to enlist the fifty-five presses and others in a formal consortium. In addition, the organizers will tender a request for proposal to a small list of prospective business partners able to host the platform and market the ebook offerings. The press directors also will organize an advisory board of experts from the Association of Research Libraries to assist in determining the final size, number, and coverage of discipline collections. The consortium expects to launch with over 2000 new titles and 23,000 older titles in subject-area collections, as well as a complete collection offer. In this next phase of the University Press Ebook Consortium project, the original four press directors managing the project have been joined by Doug Armato, University of Minnesota Press, and Donna Shear, University of Nebraska Press. In this blog entry, William W. Goldsmith and Edward J. Blakely, authors of Separate Societies make the connection between failing cities and the Great Recession. The United States now suffers from one of the longest runs of unemployment and deep economic dislocation since the Great Depression of the 1930s. Recovery is uncertain. We want to point to an unlikely contributor–the increasing isolation of neighborhoods and districts in cities and metropolitan areas. Is it a stretch to attribute even a portion of the national economic collapse to urban segmentation? Perhaps not. In our new edition of Separate Societies, we show abundant evidence of urban segmentation. The seeds of today’s urban crisis were sown by the Reagan administration, then nurtured by three Bush administrations. The government withdrew from its commitments to states and localities, leaving communities on their own, and it cut away protections for individuals. Federal changes, starting even before 1980, began to strip public assets from cities, reducing administrative capacities and shifting control from public to private enterprises, by privatizing, downsizing, and generally depriving public agencies of capacity and responsibility. As we now know, a whole series of changes not only left cities more divided by race and class, stretching any sense of social unity to the breaking point, but the changes left federal agencies themselves too feeble to impose regulations or respond to crises. The government ignored warning signs from banks and Wall Street finance firms, just as it neglected inspections to protect levees against Hurricane Katrina and ignored rules to prevent the Deepwater Horizon explosion. After each catastrophe, depleted agencies lacked the skilled staff and specialized equipment to respond. In the case of cities, what is remarkable is that “majorities” (white, suburban residents, in the main) do not feel the pain. Many in the nation’s better-off suburbs don’t even notice, presumably because they don’t suffer immediately from the fallout and they are far separated from the populations who do. This blindness seems akin to the lack of opposition to the immensely costly, diplomatically damaging, and apparently futile wars in Iraq and Afghanistan, a lack abetted by the absence of the military draft or any direct increase in taxation. In the new edition of Separate Societies, we fast forward from the Reagan urban damages of the 1980s to today, showing that city conditions have grown even worse. Government disinvestment and global competition abetted by runaway corporations have fostered private wealth creation, while public assets have been plundered or neglected. Concentrated private wealth holdings have grown immense, while middle-class and working-class incomes have stagnated or declined. The capacities of city governments have shrunk dramatically. The nation has neglected the building and rebuilding of public assets ranging from roads, bridges and levees to the schools and libraries that are necessary as building blocks for the new post-industrial economy. The wealthy have gained at the expense of the poor. Today the distance between rich and poor is the longest in the nation’s history. The poor continue to be under-educated and cannot participate in wealth creation; instead they are increasingly imprisoned or on the streets, homeless and often hungry. As we generate poverty we reduce our numbers of educated participants integrated in a growing economy. Our rich and very rich citizens retreat even from suburbs, to private schools and private, gated, exclusive communities. Rebuilding the American city requires a new industrial policy, emphasis on education, and programs for family support. National leadership is required to seek a nation of hope rather than one of fear. Judging from his writings and early speeches, President Obama is following in the best democratic traditions of Jefferson, Lincoln, and Roosevelt, sees the problem, and took the first step toward closing some of the gap with a national health plan. 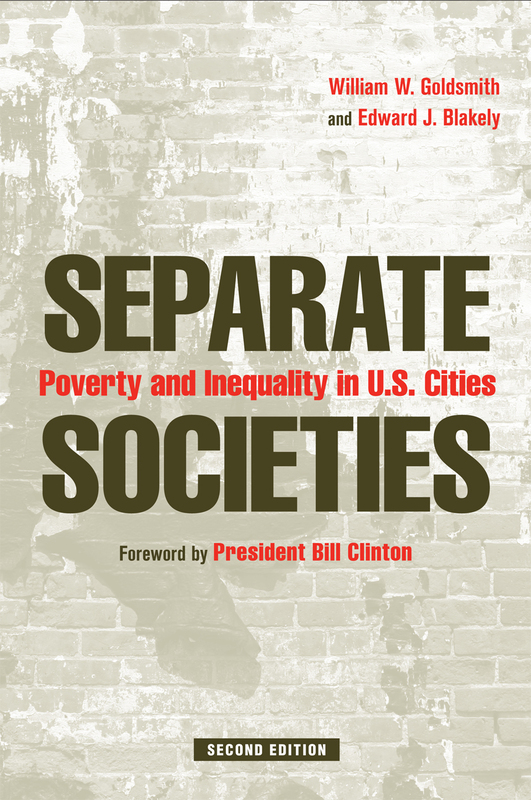 Separate Societies: Poverty and Inequality in U.S. Cities, Second Edition, with a Foreword by President Bill Clinton, is now available from Temple University Press. 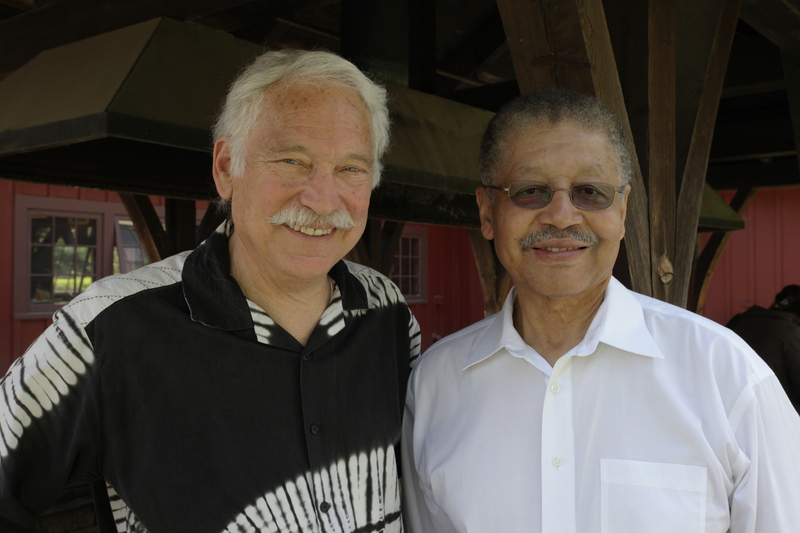 Photo of William W. Goldsmith (left) and Edward J. Blakely (right) by William R. Staffeld.